Munneswaram, a slumbery, sleepy and normally inactive hamlet, lying in the outskirts of Chilaw, comes alive this season, with complex ritualistic festivities, ceremonies and processions, culminating with the water cutting ceremony, to be performed at the Deduru Oya, two miles off Chilaw, on September 16. The Munneswaram temple, dedicated to Lord Ishwara, is reminiscent of other celebrated and renowned temples like Koneswaram and Thiruketheeswaram, in which, three Sivalingams are enshrined. The main temple at Munneswaram has been revamped, largely due to generous donations and assistance by devotees, who throng the sacred precincts to invoke and implore the deities, and solicit spiritual succour and material comfort. Devotees from all walks of life, especially Hindus, visit this august shrine annually to seek favours. Often, they are seen inside the temple _ so gorgeous and spacious _ keeping vigil, and absorbed deeply in prayer and worship. They do other repentant acts in reverence. They beseech and entreat divine solace and consolation, by making their petitions and offerings. In the days of yore, visitors to Chilaw, during this festive season of Munneswaram, will recall and hark back to the carnival atmosphere that prevailed then, with a variety of shows, open-air theatre and entertainment, to attract crowds. Nevertheless, the glamour and charm, the hectic, hurly-burly climate of amusement, enjoyment and distractions are galore still, for the youth and children. Parents bring along their children to show the colourful extravaganza, the manifold sundry items, the merchandise and wares of vendors exhibited for sale. Interesting enough, this busy thoroughfare is restricted to either side of the road, leading to the temple _ and the merry-go-round, the public shows, fun and recreation to regale the youth are all situated far away, as these detract them from the religious atmosphere of the festival. But, many fancy stalls leased out for the festive month are lined close to the main temple, to lure the crowds, without which, the festive air, the cheer and the extraordinary spectacle of the Festival is lost. Devoid of this gala atmosphere, the traditional visitor to this hallowed, age-old Hindu sanctuary would be otherwise chagrined and dismayed. 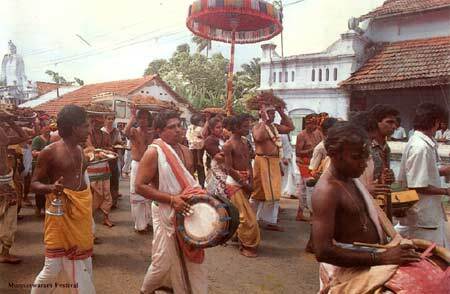 Festivities, `kavadi' dancing and processions are held each day to perpetuate the spirit of the Festival. Looking back to the festival legend of this glorious Hindu shrine, Munneswaram is regarded as one of the oldest Hindu temples in the island. And it has a strange origin; and according to legend, Rama, after slaying Ravana, was returning to India with Sita in his "Air chariot,'' when, impulsively, a desperate feeling of guilt gripped him. And, passing Munneswaram, he espied a spire of a temple, and decided to alight and worship there. While praying, Lord Siva and his consort Parvathy appeared before him; and a feeling compassion for the penitent Rama, ordered him to enshrine three Sivalingams, one in each of the most sacred places: Munneswaram, Koneswaram and Thiruketheeswaram. Lord Siva, according to legend, had pointed to a place north of the Mayavan Aru (Mee Oya), and told him to enshrine the relic. And Rama built the temple at the exact spot, which is now known as Munneswaram. The festival, too, is obscured in antiquity, and according to legend, one full-moon night, in the month of Nikini, a sage who was meditating under a banyan tree looked up and saw the goddess Amman, the mother of Skanda, who granted him his wishes. He asked her to bless all the pilgrims assembled there for worship, and ever afterwards, that August night, a great festival was held in memory of the meeting of Agastiar, the sage and Amman, and is continued to the present day. The festival which began on August 20, 1997, with the flag-hoisting ceremony comes to a close with the water cutting ceremony, and after a Thanksgiving ceremony held late in the evening at the promenade at the sea beach, Chilaw. Each year, the Big Chariot, drawn by two white bulls, draped in silk and adorned with garlands, carrying the deity, is escorted in procession through the Chilaw town; and at the promenade, beating of drums, playing of flutes and `kavadi' dancing are performed, in a spirit of gratitude. In the early hours of the morning, the Great Chariot returns to the temple square. A visitor ushered casually on an odyssey into the precincts of the inner temple, will be overwhelmed to discern its refinement and magnificence _ the large corridors unravel its elegance and grandeur. A strange silence and serenity prevail _ lights in brass lamps flicker and fade, symbolising the infidelity and fickleness of human nature. The burning of incense and naphtha, radiates an exquisite fragrance, cleansing and purifying the environment and the sanctuary. Traversing inside the temple, one is struck by an unforeseen force; the impressive deities, the inner walls and its aura echo a stillness and abiding peace. Many adherents are seen rambling and roving around, gazing at its augustness and sublimity. The rich and the poor, the noble and the common, have some time or other, paid a visit to this grand old temple. Visitors and devotees, who have come once, come each year, to pay a visit, as a place of pilgrimage, and return home, unfettered, unburdened and unencumbered of their worldly cares and anxieties. In the vicinity of the main temple, is the imposing temple of goddess Badra Kali, whose grace, and indulgence is sought by devotees who are desperate. 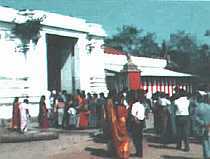 This temple was dismantled and a modern temple was constructed at the same venue, this year, costing several lakhs of rupees donated by the pilgrims. Strict police surveillance is maintained during the last week of the festival, as pickpockets, pimps, prostitutes and purveyors of narcotics, mingle with the devotees. All health facilities are provided by authorities; drinkable water too is supplied throughout the day, including transport facilities, to and from the temple. This festival has its share of woes, as beggars invade the area, turning up as bad coins.